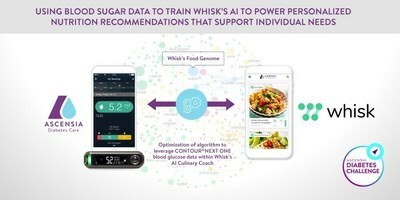 Whisk's solution was selected from 116 entries that were submitted to the challenge from 25 countries and they will receive a cash prize of €100,000 to build and pilot this exciting new service for people with type 2 diabetes, working closely with Ascensia Diabetes Care to bring it to patients. Whisk's core technology uses extensive food ontology known as the Food Genome™, that incorporates and understands macro and micro-nutritional data, flavor compounds, store availability, price and promotions. Whisk is currently available in the US, UK and Australia, powering half a million shopping lists every month at grocery retailers including Walmart, Tesco and Amazon Fresh. The competition also awarded two runners-up prizes. US-based Qstream were awarded a runner-up prize for their mobile learning platform that combines a concept known as spaced education with engaging game mechanics. This platform is designed to encourage meaningful behavior change and has been proven in a recent randomized trial to generate sustained and meaningful reductions in HbA1c in people with diabetes. xBird, a Germany-based medical artificial intelligence software company was also named as a runner-up. Their software analyzes micro-movements, collected by smartphones and wearables, and cross references them with historical blood glucose data, with the aim of being able to predict and detect potential hypo- and hyperglycemic events. Both runners-up will receive a cash prize of €30,000 to further develop their solutions.